By sheer coincidence, I happened to be at the same location as Marco Pinter and several dancers were practicing for the upcoming show of Gravitational Forces at this week's CAF Forum Lounge. 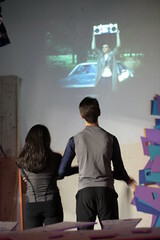 CafPress' blog has the writeup of the event with dates and descriptions and all that good stuff. 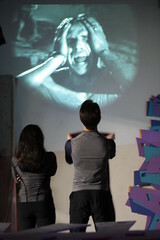 Marco was running through some of his video projections, and everyone took a break from their work to watch the preview, which appeared to be a montage of passionate relationships in cinema. I grabbed some snaps, so here's your sneak peek, too! Growing up in the era of the Muppet Show, a few of their guests made a strong impression on me. One of them was the performance troupe Mummenschanz. I specifically recall the figures adorned with rolls of toilet paper on their heads, one roll each to represent their eyes, ears, mouth and nose and they silently conversed and displayed emotions through the paper scrolling out of their heads. At the time, I didn't know the name of the troupe. Later, when they appeared in an episode of that quirky tv show, Northern Exposure, I finally learned they were Mummenschanz. On 19 November, over 30 years later, they put on a show at the Granada and you can bet your stars I was there to relive the memories. And what a treat it was! This troupe has been together for over 40 years, the same four people, building on their routines with new props and new ideas, but replaying the traditional ones exactly. The whole audience was enthralled. The children gasped innocently and the adults seemed so incredulously fascinated I wondered a few times if there had been a group smoke out just prior to the show that I missed out on. I felt there were two kinds of spectators at the show. 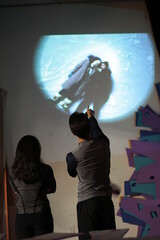 The first was the group that lets the imagination go wild, forgetting there were real people behind the objects rolling and floating about on the stage and allowing the objects to come to life. The other group would analyze each vignette, trying to break down the engineering and manipulation of the creatures on the stage to either replicate the object for a future costume or simply because of natural inquisitiveness. Either way, it was a lovely and satisfying show that ended all too quickly. As luck would have it, we stuck around to catch up with friends who were also at the show and this resulted in the opportunity to go backstage and meet some of the troupe! Not only that, but we got to see some of their props. Happy day! The item I played with was a pliable rubber mask, as seen in the skit below from a 1976 Muppet Show. During the vignette, the mask weighs up to 5 kilos (about 12 pounds) of piled on clay. Imagine that much weight hanging off the front of your face...for 40 years. Earlier I said the troupe has remained the same since they formed. The clay we played with on the mask was also the same clay as they used for all those 40 years! Talk about long-stanging memories embedded in objects. We were playing with history. Three of us shared a carnitas torta, and a chile verde burrito. Each cost $6 and we had leftovers. Bargain! The torta was stuffed with shredded pork and finely diced fresh jalapeno which gave it a good amount of zippy flavor. The chile verde burrito was the winner item with big tender chunks of pork, wrapped up with beans, rice and lots of melty cheese. Basically a plate of food that had been enclosed in a large tortilla. Best eaten with a fork. Tip: grab the food to go, and walk it to the sunken gardens, or to the open patio at la Arcada, where the old Acapulco/Stateside is and enjoy your front row view of the turtles. A month or two ago a new record shop quietly opened around the corner of Santa Barbara St. and de la Guerra St. Where the old Frameworks used to be. It was started by a Portland couple who built the shelves and display cases themselves. Within the shop is a cornucopia of vinyl for all musical tastes. Best of all, these records are priced very very well. Most are in the $10 range. Rarities and collectibles are fairly priced, as well. I said fairly. They know what's good. 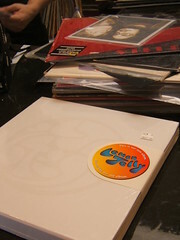 I poked my head in a while back, just to look around, and I walked out with a five record set of new 10" Lemon Jelly singles priced under $30. And I don't even *own* a turntable. An acquaintence from Los Angeles came in for a browse and dropped a fat wodge of cash on a stack of records. Los Angeles! Where Amoeba is! Why? Because the prices were so darn good and he found things he wanted. Lots of things. That's so cool! Our little Santa Barbara. Warbler finally had its grand opening party on 13 November and it was packed to the gills. I'm not sure I'd seen so many SB hipsters in one place, it was like all the contents of a thrift store clothing section had shifted en masse to Warbler. 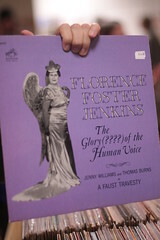 It was on this night that I also found another vinyl gem that's close to my heart, Florence Foster Jenkins. If any of you saw Ensemble Theatre's production of Souvenir by Stephen Temperley, which played from 4 Feb - 28 Feb earlier this year, you were treated to the true story of Ms. Jenkins: the matronly socialite turned opera singer who sold out Carnegie Hall, despite being (or because she was) completely tone deaf. I've owned the cd for years, and here it was in vinyl at Warbler, both as the full album and several singles of her, er, greatest hits. Priced to sell, I might add. Like I said, Warbler knows what's good. Ahem. 131 E. De La Guerra St. Does anyone know what the backstory and current story is with the snack shack at Haskell's Beach? It seems like a nicely constructed building, reminding me of the old bath/beach house down at East Beach, but in all my visits to Haskells it's been closed. Is it ever open? Is it a city building or a Bacara one? Coincidentally, at the moment I decided to post this query, I saw a Haskells article on Noozhawk, regarding the approval of new home construction in the area. I took these photos earlier in November, during a lunchtime break. Obviously, the weather was strikingly beautiful that day, which is what brought me out to the beach in the first place. Haskells is an underappreciated gem that seems to constantly be in the middle of a quiet and bitter dispute over access rights. At this point, neither side is a Mother Theresa. It's either the Bacara - The Man, resentful, entitled; or the surfers - The Dude, resentful, entitled. Catch my drift? Perhaps consider this solution: just go there. If you're in Goleta and looking for a nice walk, this is a place to visit. If you like beaches, this is a place to visit. If you like to look at Snowy Plovers, this is a place to visit. If you have your lunch with you, this is a place to visit. Because when more people visit, who aren't are either side of the extreme sense of possession of the spot, the more that sense of resentment is diluted. There's a great parking area, and the path down to the beach is lined with California native plants. If you start walking back towards Santa Barbara there's a wooded walk area. If you keep on walking you'll eventually get to the Ellwood Bluffs and Coal Oil Point (make sure it's low tide). And if you walk further away from Santa Barbara there's tidepools and the picturesque Haskells Pier. And there's a picnic bench to sit and eat your lunch, but you'll have to bring it yourself, because that darned snack shack is never open. Again, does anyone know what the deal is with that building? I took this snap during intermission on opening weekend. I loved how the set appeared sparse and simple, with the open beams creating complex shadows on the floor. There isn't much more I can say about Maurie Lord's production of Curse of the Starving Class that wasn't already posted by Tracey in an earlier City2 blog, except a few juicy tidbits. * If you like bacon and you attend the play hungry, it will be torture. *If you like cute little sheep, you will be charmed, and the cast will be upstaged. * The play SOLD OUT last night, 19 November. Good job, Maurie! * Tonight's the last night to go. So go! I went to Kelli Scarr's show at Muddy Waters not knowing what to expect and not knowing a single song of hers. What I heard was a beautiful set, a sort of cross between Sia and the Cowboy Junkies. This was on 4 November, First Thursday, and also related to the New Noise festival/conference. Scarr and her group was the last of four bands performing that night at Muddy and it went on past midnight. In fact, I don't think she even went on until after midnight. And I had work the next morning. But we were so entranced by the music that time did not matter. I'm guessing the musicians felt the same way - it seemed they played with their eyes closed. Pity the cafe was sparely populated. But that kind of stuff happens on school nights. A Pulitzer Prize winning play by Paula Vogel, performed at the Arts Theatre at UCSB. It was a simple set, and balanced the intense and dark topics of the play.